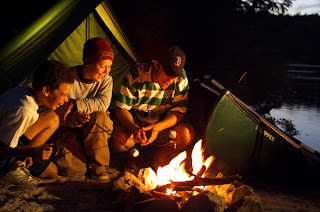 Although camping is a time when you head outdoors as a family to enjoy the simplicity of nature, it doesn’t mean your meal options are limited. Instead of eating that stale can of beans and roasting boring hot dogs, think outside the box with these fun family camping meals. Although eggs are a staple of breakfast, egg burritos can actually be served at any time. Crack some eggs in a greased frying pan over the fire, throw in some onions and green peppers and stir it around. Once it’s done, grab a tortilla, fill it with eggs and roll it up. This is the kind of fun and simple hands-on meal kids love. Everyone loves the simplicity and ease of Macaroni and Cheese. This is a fast and fun meal that’s easily whipped up at any campsite. Start off with some pre-cooked macaroni pasta and an aluminum bowl. Then mix in grated cheddar cheese, milk and butter. Cook for a few minutes and it’s ready to eat. Put a twist on the classic camping meal by turning the hot dog into a Pig in a Blanket. Instead of a hot dog, take a mouth-watering sausage and affix it to the end of a stick. Get dough (preferably something like the crescent rolls from Pillsbury) and wrap it completely around the sausage. Then, cook the pig’s blanket over the fire until you’re satisfied and eat up. Embrace the outdoors by making this simple, but delicious snack over the campfire. Pour some tortilla chips in an aluminum bowl, let the kids pick their favorite toppings and sprinkle cheese all over. Then hold the bowl over the fire for a few minutes to get a creamy creation your kids will love. If your kids are tired of making the same old campfire S’mores, treat them to a new idea that utilizes similar ingredients with an added twist. Simply cut a slit in a sealed banana, stuff chocolate chips and marshmallows in the slit, wrap in aluminum foil and bake over the campfire. After a few minutes, take it off, put the peeled banana in a bowl and taste an unforgettable camping dessert. Another fun camping dessert that’s much healthier is the baked apple. To make these, you carefully cut the core out or make four slices halfway through the top. Then, put whatever you like (i.e. brown sugar, walnuts, raisins, cinnamon) inside the apple. Wrap it in greased aluminum foil and place in the campfire for about 20 minutes to cook. Once it’s cooled down, you’re treated to a great outdoor dessert.